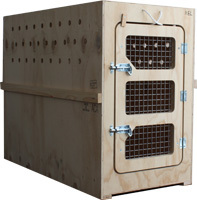 We also offer custom made Wooden Pet Travel Crates according IATA standards, at affordable prices. For certain destinations, as per the regulations we can fumigate the wooden travel boxes as well. If you are planning on traveling more than once it is advisable to choose a plastic crate as the wooden box is theoretically for one/two use only.